Three designers share their tips for using bold hues in living spaces. 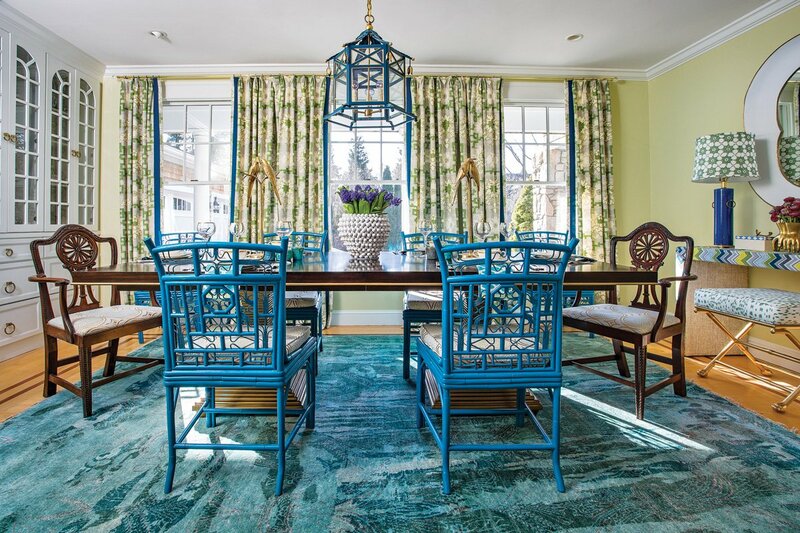 A riot of blues and greens sets the tone for this dining room redesign by Jocelyn Chiappone of Digs Design in Newport. Photography by Chris Vaccaro. 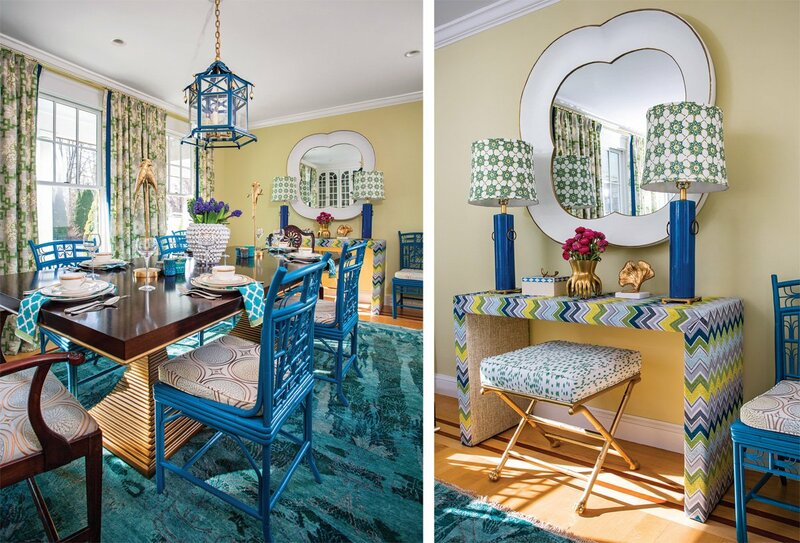 Jocelyn Chiappone, owner of Digs Design in Newport, loves incorporating color into the spaces she creates for her clients. So when it came to redesigning her own dining room, she didn’t hold back. A vintage lacquered cabinet in the “perfect peacock blue” served as Chiappone’s inspiration and starting point. Next, she selected linen draperies that played up the greenery that peeks through the windows in warmer months and an expandable table to accommodate the large gatherings the family often hosts. The dining table is from Bernhardt. 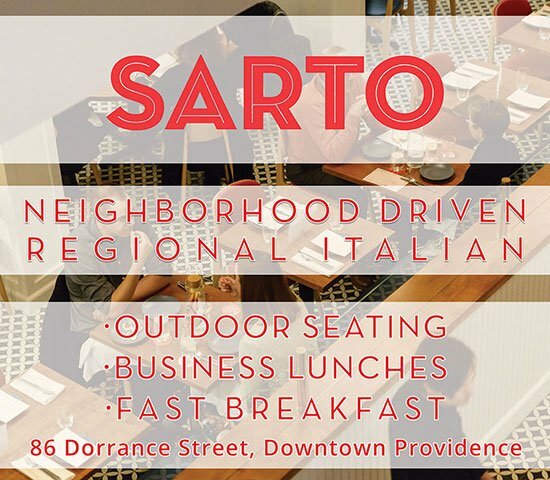 Chairs are from New York-based furniture wholesaler, Red Egg. Below, the console table is upholstered in fabric by Schumacher. Photography by Chris Vaccaro. Chiappone’s love of chinoiserie is showcased in the dining chairs, which share the table with antique host and hostess seats. “Mixing seating tends to look more curated and less out-of-a-box,” Chiappone advises. An upholstered console further reinforces the color scheme, while the large plaster mirror hanging above adds drama and organic lines and makes the room feel bigger. Lastly, “Sesame” by Benjamin Moore, a happy, but not over-the-top green hue, was added to the walls, ensuring the room has that festive feel Chiappone wanted. Though a bold choice of wall color, the deep purple paint doesn’t darken the room too much thanks to loads of natural light and white trim. The room was inspired by a collection of Victorian glass given to the designer by her aunt, pictured above. Photography by Chris Vaccaro. Like Chiappone’s design, it was a beloved item that inspired the violet-hued room in designer Courtney Taylor’s Providence home. In this case, it was a collection of Victorian slag glass given to Taylor by her aunt. Looking to create a proper room to showcase the coveted pieces, Taylor decided to redesign a front room with east- and south-facing windows so she could employ a matching wall paint without fear of the room feeling gloomy. As luck would have it, Taylor, who runs the Providence-based Taylor Interior Design with her mother, Nancy, also had on-hand an antique light fixture in the same purple shade as the slag glass that became the room’s centerpiece. Finishing off the room, Taylor selected a few purple furnishings to carry the color throughout, but kept the majority of the pieces neutral for balance. “There wasn’t a need to add more color since my existing furniture and possessions had such a strong presence,” Taylor says.